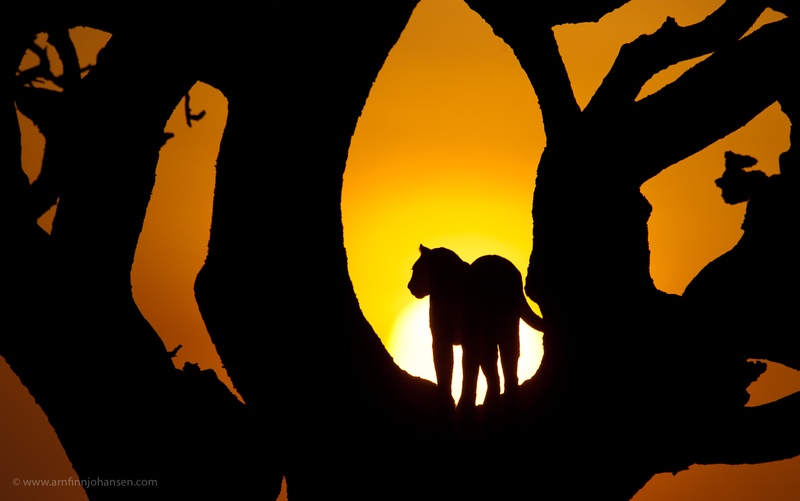 Selected from more than 21,000 images of which 126 were awarded, I am delighted to let you know that one of my images; “Leopard Silhouette” has been highly commended in the Art in Nature category in Nature’s Best Photography 2011. This annual competition, known as the Nature´s Best Windland Smith Rice International Photography Contest, is hosted by Nature’s Best Photography Magazine based in Washington, D.C. and is one of the largest international nature photography competitions in the world. It is open for both amatuers and professional photographers world wide, and in 2011 totally 1,523 photographers from 47 different countries – in all over 21,000 images – entered the competition. This was my first time ever participating in this contest, and I feel both humble and proud to receive such a prize. I also like to emphasize three other Norwegian photographers; Lars Andreas Dybvik, Orsolya Haarberg, and Kjetil Schjølberg, who also got highly honoured images. It is great to see how Norwegian photographers succeed in international nature photography competitions. All images are displayed along with the category winners and published in the Fall/Winter Awards Special Edition issue of Nature’s Best Photography wich is now avalible. My leopard silhouette photograph was taken in Serengeti in Tanzania two years ago. I have been many times in Serengeti for allround wildlife photography. Generally I like going back to places I know. I think being there before gives me an advantage, and this time we went sixteen days on safari primarily for photographing leopards in an area of Serengeti I know well. One late evening going around in our jeep we found a leopard resting in a fever acacia tree by a dry river bank, and early next morning before sunrise we decided to go back looking after him. After a while we found the leopard – from long distance we could see him sleeping in a tree. The sun was rising, and as I with my binoculars could see the cat suddenly raising up I realized that the angle of the rising sun could be just perfect behind the leopard. So we drove as quickly as we could to get closer, then reduced speed and carefully got the vehicle in right position just in time to photograph the leopard in silhouette with the sun behind. For about one minute he stood there – all the time looking around and changing his position – and from all my pictures I got this one image only were one can see his eyelashes at the same time as his body is clear from the trunk. For me to catch this elusive and majestic leopard overlooking his hunting grounds in the early sunrise of Serengeti was a magical moment I will never forget. Leopard overlooking his hunting grounds in the quiet, early hours in Serengeti, Tanzania. Highly honoured photograph in the Art in Nature category in Nature’s Best Photography 2011. Nikon D3, Nikkor 400/2.8 VR + 1.7 converter, 1/8000 sec at f/5.6. -2/3 EV, ISO 640. Du har klart det igjen Arnfinn. Gratulerer. Det blir nok ikke siste gangen. When will I see you and your lovely family back in Brazil, for another jaguar photo shoot? Congratulations, Arnfinn!Really fantastic picture; can imagine the moment You´ve got it.Greetings from Tuula, too! I am going in a few hours to Mumbai to collect \”Sanctuary India Wildlife Photographer of the year\” award. Will mail the picture to you soon. – see you there for a photo lesson!?! Et fantastisk bilde tatt i et magisk øyeblikk.